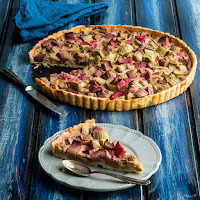 Wash the rhubarb and cut it in pieces of 1 or 2 cm. Stretch the shortcrust pastry and lay it on the bottom of the tart pan. My tart pan has 32cm as diameter. Mix the eggs with cream, sugar and cinnamon. Pour the composition over the shortcrust pastry in the tart pan. 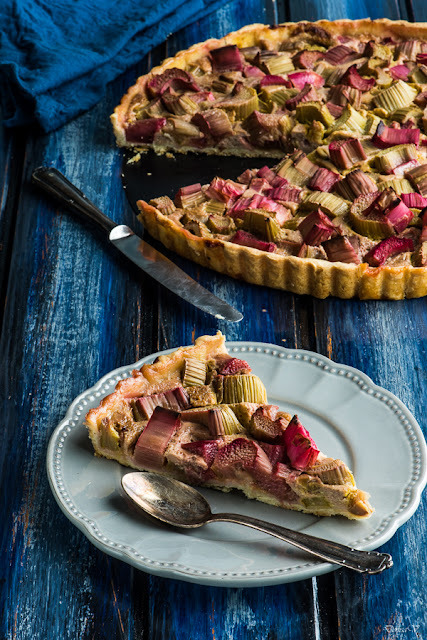 Spread the cut rhubarb over. Bake in the preheated oven at 210ºC for 1 hour. Recipe inspired from Marmiton les meilleures recettes de pâtisserie et desserts de Marmiton, page 36.